Mainstay Life Services is a nonprofit organization that provides lifelong, high-quality support services to ensure people with developmental disabilities lead fulfilling lives and realize their vision of a desirable future. The organization turned to Mindful Kreative/Downing Communications to develop and implement an integrated marketing communications (IMC) plan to heighten and communicate Mainstay’s reputation both internally and externally. Mainstay Life Services needed to create a signature capabilities piece to raise awareness of its important work. Reflective of updated brand standards, this piece showcases how the organization is enriching the lives, unlocking the potential and providing the keys to success for those it serves. This piece also needed to convey what Mainstay is all about; highlight its mission, programs and services; focus on client success stories; and compel people to want to learn more about the organization. Mainstay need to create a compelling and informative campaign to ensure that employees, board members and outside sources will refer to it frequently; use on the job; and pass on to others as a basis for increased referrals to Mainstay. Mainstay has a great deal of information that audiences need to access in order to make decisions about use of services or employment. To meet these needs, a capabilities piece with a two to four year shelf life was recommended. The piece needed to include some way to provide specialized and individualized messaging for each audience in short-term, changeable methods of distribution. This combination of materials would allow Mainstay to include more targeted communications information to different audiences based upon individual needs in an efficient and cost-effective manner. Mainstay provides a safe, secure and loving place for people with developmental disabilities to enrich their lives and unlock their full potential to be productive members of society. 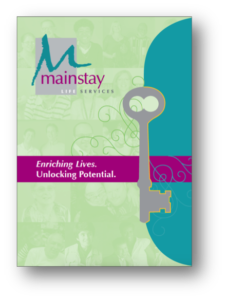 Mainstay offers quality, compassionate services to people with developmental disabilities in the community. Mainstay provides the necessary support to achieve goals and make positive contributions. Mainstay hires skilled employees who provide quality life support services to ensure persons with disabilities succeed. Mainstay provides a variety of services to help persons with disabilities reach their fullest potential. Mainstay understands that each person served has a unique story to tell. 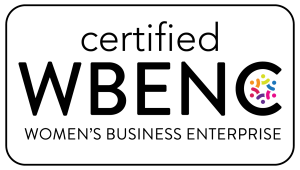 In keeping with the tagline and messaging, the agency focused on the word “unlocking” throughout the design and messaging of the four-color capabilities piece. The cover boldly states the theme and features a silver key die cut that inserts into the flap to “lock” the piece. 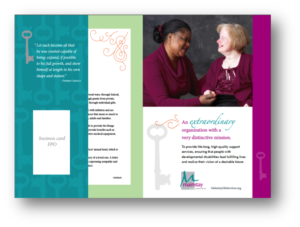 When the reader opens the piece, they see the story of Mainstay and its unique services unfold before them, including inspirational quotes on overcoming diversity. Based on the survey results, there is a great emphasis on the stories of Mainstay clients and staff – both visually through stunning photos and emotionally through heartwarming testimonials. The piece also includes information on all programs and services presented on pages of different sizes and paper stock, with interesting and light design, to draw readers to the information they need to know to make an informed decision about using the organization’s services. To emphasize the theme, the design uses the key art and other consistent design elements and colors throughout the piece. To make the piece more useful and to save money, a pocket is placed on the inside front cover and insert templates were developed for departments to provide personalized information on specific programs, services, people and events that could not appear in the main brochure. The initial response to the introduction of the new capabilities was overwhelmingly positive. Anecdotally, employees, board members and the general public voiced how impressed they were with the look, feel and messaging of the piece.